After an adventurous journey through Europe and a thrilling online battle, the winner of the eneloop ambassadors’ tour has finally been announced. The Latvian team Young Folks won the eco-friendly competition. Together with the 11 other teams, they raised 5,363 euros for charities Aktionsgemeinschaft Artenschutz and Cheetah Conservation Fund. Competition organiser eneloop later surprised competitors and charities by doubling the amount to 10,726 euros. 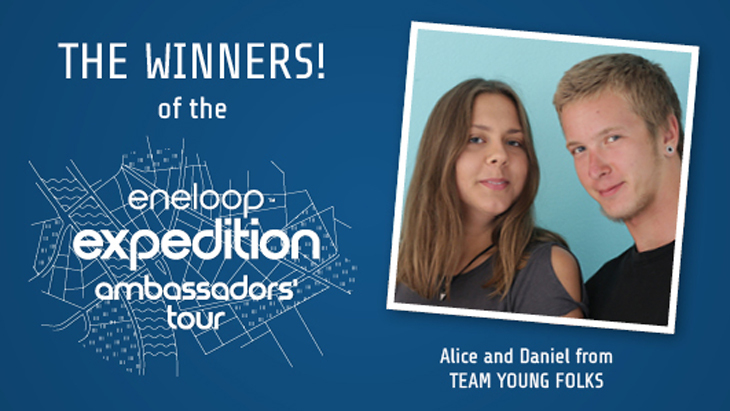 Winners Alice and Daniel received an extra reward for their efforts: a travel voucher worth 2,500 euros. The celebration ceremony of the prize and donation took place in Berlin on 29 September. The final battle of the eneloop ambassadors’ tour started on Tuesday 18 September 2018 and lasted until 25 September. In that week, the 12 competing teams had to create a compelling video about their journey and ambitions. The video which received the most votes determined the winner, rewarding team Young Folks with a travel voucher of 2,500 euros. During the competition they raised 5,363 euros, together with the 11 other teams (Tortelli, Sustainably Sassy, Asapguys, Sail4sustainability, Woanders, Backpack Gals, Kosen Rufu, Polishing the World, Omait, Young Folks, Lost in Compass and Han Duo). The donation was later unexpectedly doubled to 10,726 euros by rechargeable battery brand eneloop. The prize and donation were presented formally to the winners and the charities on Saturday 29 September. The ceremony took place in Berlin, in the MediaMarkt in Gropiusstadt. The store also hosted a sales promotion that day, with discounts on eneloop batteries and chargers for all consumers. The eneloop ambassadors’ tour was hosted by rechargeable battery brand eneloop. The brand created the contest in order to draw awareness to the welfare of our world and its residents. Twelve teams participated. During their journey, they all pursued the same goal: raising a maximum of 21,000 euros for the charities ‘Aktionsgemeinschaft Artenschutz (Action Campaign for Endangered Species)’ and ‘Cheetah Conservation Fund’. For every follower gained on their shared Facebook page, eneloop donated one euro to the aforementioned charities. Later on, eneloop would double the total donation. The eneloop ambassadors’ tour started on 22 June 2018. The first part took the twelve pairs on a journey through Europe. While travelling as eco-friendly as possible, each team had one week to tackle three assignments. When reaching the agreed location, the eneloop battery baton was passed on to the next team. The final battle was fought online on the official campaign website. In order to draw more attention to the contest, eneloop launched limited edition AA and AAA batteries: the ‘eneloop tones botanic’. They all wore different botanical hues and were available both online and in European retail outlets. The brand also rewarded supporters of the eneloop ambassadors’ tour with extra discounts, promotions and competitions. Read more information on the participants, the various routes, and the charities on eneloopambassadorstour.eu.